This weekend was going to be my first long run that I actually treated like a race. 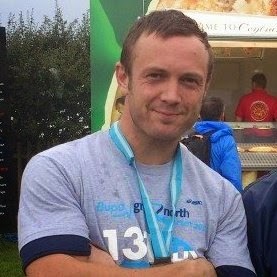 I do not want any nasty surprises on race day, so all my long runs until the Great North Run I will try and prepare for, and control as many variables as I can. 1) It's best not to drink a bottle of red wine the night before. This might seem obvious, but a Saturday glass of vino can quickly turn into two, then it's all downhill from there. A headache, poor night's sleep and dehydration could have all been avoided. Will I ever learn? 2) My shorts don't have pockets. It's good I discovered that today and not on race day, as I need somewhere to put my gels and car keys. I have a clip on pouch somewhere, I just need to find it. 3) Energy Gels are a must for long runs. And not just on race day. 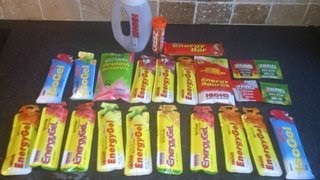 I've had a few different brands whilst running different marathons, and my pick would be High Five EnergyGel . They have helped me out with my challenge by sending me a Marathon Race Pack which you can buy here.. High 5 Sports Nutrition Marathon Race Pack Mix , and it makes a big difference. I had 3 gels during my run, an energy drink before I started, and at the end of my run I still had plenty of fuel in the tank, even after doing my longest run in a year and a massive improvement on last week's minutes per mile. It's important to have used a gel on training runs, before the actual race as you don't want to try anything new on the day if you can help it. I had one before the run, next at 45 minutes and then another 20 minutes later. I will be using High5 on all my long runs now. The water carrier pictured above was a great help too, fitted right into my grip and is also big enough to squeeze 12 ice cubes into. Which I did. It's important to take water with the gel to get the most out of them. Also, the water stations may not be there when you are thirsty, so bring liquid with you on race day.It's something I haven't done before, but will do this year, as I have been thirsty at certain points of the race and had no water. No water means performance takes a hit. 4) I need to turn my GPS on my phone on before I start using my running ap. I ran for five minutes at the start, and then it told me I had run zero miles. Not sure how this happened, but I need to pay close attention to making sure everything is switched on that needs to be, my phone is charged and that I have my arm band with me. It is a great help and I need to use it as best as I can. 5) Toilet breaks cost time. I lost about 1 minute of today's run due to having a quick pee stop. I would hate that to be the reason for not completing the run in under 1 hour 25 minutes. At the beginning of the Great North Run there are about 55,000 runners all going to the toilet in the few minutes before the race. If you suffer from "stage fright", this can make things slightly awkward. The first year I went to the toilet, did the warm up, started the race and after only the first minute had to stop again for a pee break. Maybe not something you want to read about, but it happens to us all, especially after drinking so much pre-race liquids. 6) I can do it. That is the half marathon distance achieved with over a month to go before the big day. All I need to now is run it 20 minutes quicker. After today's run I have started to get a bit of confidence back. I needed a mental boost, and this was a big one. The fact that it was 20 seconds faster each mile than last week's long run, has also given me more belief in myself.